The big question is who can correctly answer the question in the title. Apparently not many. Recently I’ve been giving out books for nailing it and so far I’ve given out three… on ten classes. That gives approximately 3 out of 150 people… Bad odds. 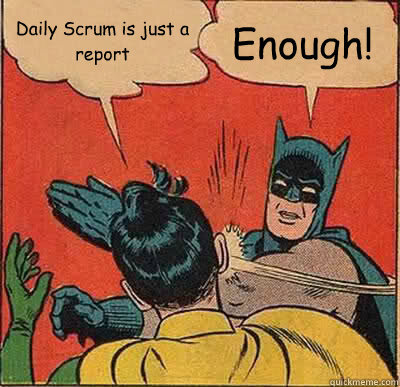 Some say, that Daily Scrum is there to communicate. (I kinda feel like Jeremy Clarkson introducing Stig now …). Some even claim it’s a daily confession. Or a confirmation of what has been done yesterday. Or a report to the Scrum Master … That just gives me creeps. – What have you done yesterday? – What will you do today? – Is anything impeding you? And so it continued with everyone. People started looking more and more bored every second. Somebody yawned. When I asked them if they want to cancel their Daily Scrum they suddenly gained energy and all at once shouted: – YES! – But to DO SCRUM you HAVE TO have a Daily Scrum! – The so-called Scrum Master protested very loudly. – Yes – I replied – but Scrum only for the sake of Scrum gives you nothing. What is the daily Scrum for? – Why would you need a communication meeting if you sit in one room with everyone, you talk to everyone constantly? – Leave Scrum be. I’m asking your common sense. – My common sense does not matter. Scrum matters. I was furious on the inside, but keeping cool on the outside. This is NOT what I taught them earlier! His stance was almost impenetrable, but suddenly I got some help from another direction. – Hey! – the girl, Annie spoke up – we are trying to come to something! Just stop behaving like a kid and answer the question. Can’t you remember our own words – if you don’t know what to do use your common sense? Pull yourself together! Suddenly his expression changed from an angry caveman to a regular person. – Let’s see what Scrum says about that in just a moment, but I can assure you there is no confession or communication reason in the Scrum Guide. Guys – I spoke to the team – what’s your biggest problem right now? – We’re having difficulties with planning our work within the sprint. – So what could help? After some short brainstorming they arrived at a conclusion that they would like to plan their activites a little more often than every two weeks. I recommended a simple solution: Once a day ask a question – How are you progressing towards the Sprint Goal? I needed to deal with the so-called Scrum Master still, so I took him for a face to face session and settled the dispute. Two weeks later I came in around 2PM. The room has changed. Instead of an empty corner, there was a huge cardboard board with sticky notes all around it. People were discussing something lively, it was on a verge of a fight, when it suddenly stopped. I heard the Scrum Master asking the question: How are we doing with the goal guys? Everyone rushed out of their chairs, they talked energetically , flipping cards back and forth, adding new ones and removing some. In the end Scrum Master counted the number of cards to put it to a management report. – Now, that was a great Daily Scrum! – I said being very happy. – A what? – everyone seemed puzzled and concerned – but we stopped those stupind Daily Scrums two weeks ago! – That’s correct. You stopped the stupid and started the proper Daily Scrum. – Didn’t you just do that? I could almost see little lightbulbs appearing over their heads. Their pupils dilating to that precious A-HA moment. So what is the daily scrum for? Finally I have heard the correct answer. Of course communication is an essential part of the Daily Scrum, but it’s not the goal. The goal is to plan your next day and optimize your efforts towards the goal. 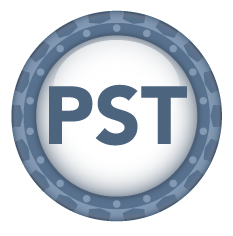 And BTW, the Sprint Goal is another misused or forgotten part of Scrum. Well… Daily Scrum is for planning – agree on that. But IMO problem with not understanding why we are doing Daily Scrum and what it is about comes from different reason. First of all most of so-called “Scrum implementation” which I’ve seen (and I’ve seen a lot of them) didn’t use correct questions from Scrum Guide – every word there has it own sense. Even You quoted above the three questions which you won’t find in Scrum Guide. “- What has been accomplished since the last meeting? – What will be done before the next meeting? “- What have you done yesterday? This real Daily Scrum question automatically indicates planning during this daily meetings. Firs is about where we are? Second what is the forecast for next 24h? Third what problems did we found in last 24h so we didn’t meet our goal, or what problems do we expect soon? I agree to some extent. IMO you should not ask the “yesterday” question at all. It’s something that if needed, will emerge on its own. Everyone should see what has been completed the day before from the Sprint Backlog. 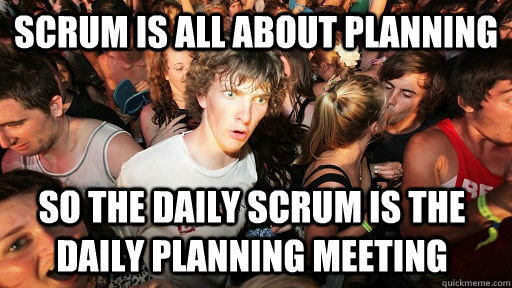 “Scrum is all about planning” – facepalm. Okay, maybe this was not the perfect choice of words. I wanted to make it look good as a meme. 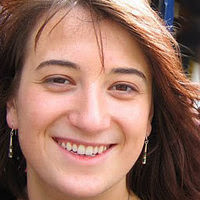 Besides, planning is a very extensive activity in Scrum. Actually you use around 20-25% of your time for planning in a sprint, plus if needed a release planning up front. And let’s not forget that following a plan is not the same as planning – the activity that lets us respond to change.